For Fall 1152, I worked almost exclusively from an outline. I would finish the art then script the dialogue in-place having a good idea of what I wanted the characters to be saying. 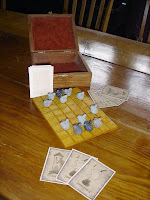 Sometimes it worked out great, other times, it proved to be daunting and frustrating. So for Winter 1152, I still start with an outline, but now I also do some scripting before I draw. For Winter I sometimes write out a complete script for certain scenes, or jot quick ideas. Too often had I thought of the structure of the dialogue for the page, and later when the time came to add the words, I'd have forgotten them, so any ideas I have about dialogue I write them as soon as they hit me. For this page the dialogue was quick and idea-oriented. I marked the lines with 'A' and 'B' to note where on the page I thought those would be used. The 'lantern breaking' I originally planned for the next page, but for the final version, it occurs on this page. This is the step that feels the most like 'work' for me. 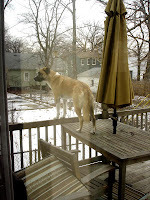 It's a balancing act 'of which panel arrangements work best with the secession of actions I need to show on this page?' 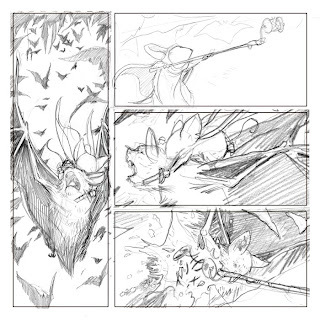 I tend to divide Mouse Guard pages on the 1/3 lines of the page, so I have a standard 'set' of layouts I can choose from and play with. 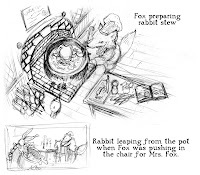 The trick is to use the right shape panel to match the motion or viewpoint, or grouping of the characters, or at least to not have the two be in conflict. 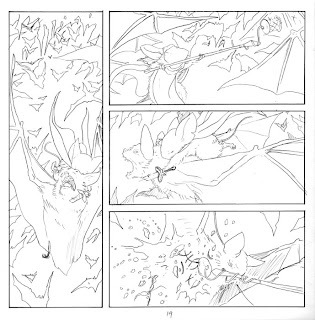 I try and imagine the panel I think is most important on that page (in this case Saxon riding the bat in the first panel was the one I focused on) and then work around that. I print out the sketches in the layout and use a light-box to transfer the page onto my Bristol. I clean up the image as I go, being more careful about contours & tangent lines. I like working this way because when I work on a drawing over and over on the same sheet of paper, I tend to get it very smudgy and dirty (which can work well when I'm rendering something in pencil, but not for inked work) This way, I have the minimum of pencil on the final bristol page and was able to work out all my erasing and re-drawing and fixing on the sketch paper or on the computer. I ink with Uni-ball Vision pens. They are waterproof and lightfast. 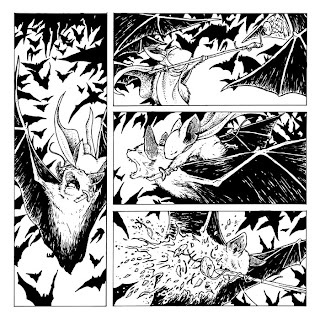 For larger fill-in areas or textures like the bats wings, I use a '0' brush and Speedball Superblack ink. This is where the page starts really taking shape. I add the textures at this point, play with line weights, and fill-in the black areas. This part is one of the most enjoyable for me (sometimes overtaken by coloring). It's something I can work on most anywhere, so I can sit with my wife while she watches TV, or I can take it with me to coffee shops, or conventions. I color using Photoshop 7. Once I have the colors 'flatted' (establish what areas are what colors using just flat color) I only use the 'drybrush' brush for the dodge, burn, and paintbrush tools. 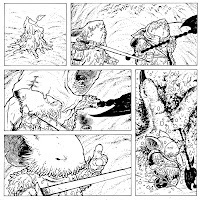 I also found that adding 'color holds' (areas where the linework takes on a color) helped add depth to my work on Mouse Guard and now it's something that I think about as I'm inking the page "What gets 'held' on this page?". 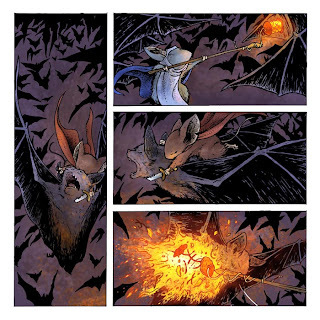 Originally I was worried about coloring Mouse Guard, not because I couldn't imagine the world in color, but because I was having trouble meshing my inks from Issue 1 of Fall with the colors. 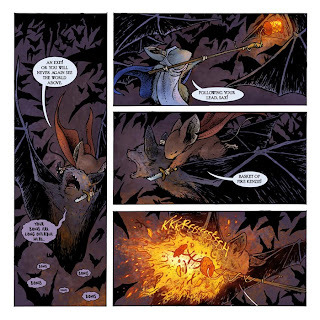 Ever since I found the right 'blend' I have really enjoyed coloring and pushing my work in ways I hadn't seen it going before I started Mouse Guard. Step 6: Dialogue & Sound Effects. Lastly, The dialogue is added. 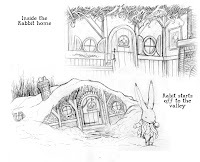 For this page, I went back to the method of writing and tweaking it after the artwork was done. I know Saxon's line in panel 1 was one that I came up with in the shower (where a great many of my better ideas come from). 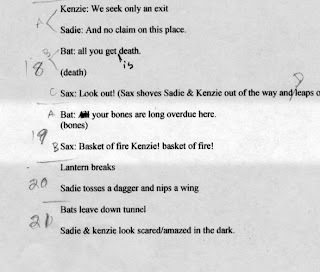 The idea to have the bats 'echo' one another was one that I had from the beginning, but hadn't noted it on the script. I am frugal with sound effects. I think there are a lot of them in comics that are either unnecessary or draw you out of the story because it looks like some clean type slapped on in photoshop. Here I had to have a crashy-hissy-burney-sizzly sound...bat flambe anyone? So, that's a walkthough page 19 of Winter Issue 3. Hope everyone enjoyed this and it wasn't too boring. At some point I'll try and record more steps in the coloring.